Hi everyone. I still had some questions before my Rift arrives. I know generally speaking you want to set up the sensors on a high place, angling them down towards the play area, but I'm still iffy on ranges. I'd read conflicting reports on how accurate the tracking is when farther away. Ex: I was planning on putting two of the sensors up on two book shelves in front of me. These two sensors would be about 6-7 feet apart from each other, and somewhere between 8-9 feet away from the play area. The third sensor was going to be placed either on another bookshelf a little off to the side behind me, or mounted on the ceiling. This third sensor would be upwards of 15-16 feet distant from the first two sensors. Is this too far? Anyone have experience with these or have a better suggestion? -I have an Asus X99 Deluxe motherboard. This is flush with USB 3.0 ports. I have 10 USB 3.0 ports on the back panel alone. Do I still need to buy a separate USB card? I am uncertain if people purchase the card because of the lack of USB 3.0 ports on their computer, or if there's another reason I would need to do so. How easy is it to actually scratch the oculus lens? Reading some stories I get the impression that it scratches like a hot knife through butter. Is this the case with the CV 1 model (I assume that's the one in the summer sale)? I ordered 44mm Healingshield covers just in case, but I don't like to stick things on unless its necessary. Has anyone had any experience with these? Has anyone tried out the VR lens inserts? I do wear glasses, but I'm more or less resigned to putting in contacts again if I have to. If you have, how well do they work? Is there any image distortion? Are they easy to remove---I can't assume that anyone else that I might want to let try would happen to have the same prescription. Thanks for your patience. I'm completely new to VR and it's a little bit more in depth than I was expecting. See this page for suggested sensor placement. I have an Asus X99 Deluxe and it works great with Rift. Just be SURE to install this USB driver update BEFORE you connect the Rift to your computer. https://www.asus.com/us/Motherboards/X99DELUXE/HelpDesk_Download/ (click your OS then the USB section and look for the driver with the Oculus fix). I use uGreen cables for everything. This is my forum signature. There are many others like it, but this is mine. Not sure about the sensor range because I still have two of them front facing but I can certainly help with the prescription lenses. You can't put lens protectors on because of the curve on the lenses so you'll have to rely on being VERY careful when wearing glasses whilst using the Rift or get prescription lenses. The lenses DO scratch easily too. I'm personally using the VR Lens Lab prescription lenses and I've been VERY happy with them myself but YMMV with them. Some people have had them falling out easily but mine have stayed in place without a problem. There's a bit of barrel distortion but after a while you get used to it and you don't notice it. Given the different experiences that people have had I'd say you'll be better off going for one of the other two though. These stay firmly in place without a problem but I've read on Reddit that taking them out and putting them in again over and over may wear the fabric so I wouldn't recommend these if you demonstrate the Rift to friends and family regularly. I think I'm going to try these out when my prescription changes just to see what they're like. According to people on Reddit that have used them they're the best option out of all 3. At the end of the day it doesn't matter which one you decide to get, assuming you're fine getting used to the Lens Lab barrel distortion, because they all do the same thing really. The problem that Lens Lab have had with theirs is that different Rifts are slightly different in size and shape for some reason. They added these rubber inserts which has helped some people but not everyone. If I was to recommend one over the others I'd go for the WIDMO VR ones because the feedback on Reddit has been unanimously good so far, that's why I'm giving them a go in a few months. Thank you for the answers! I only have a couple more questions. 1. I know that it's ok to clean your lenses with the included microfiber. Is it also ok to use something lik Zeiss lens cleaning wipes? I know alcohol is a big no-no, but I'm not sure about anything else. 2. I've been doing more research on how to setup everything and a few articles/videos recommend having a HDMI/DVI converter because you need to be able to use your monitor and the VR headset at the same time. Now, I have an ASUS Strix 1080 ti, and If I'm seeing things correctly, it already has 2 display ports on the back. Is there any reason I'd need a converter? Can't I have my monitor in one DP, and my rift in the other (plus HDMI extension cable)? You don't need an adapter if you already have the right ports to plug both the Rift and the monitor in directly (which is always best). The adapter issue comes up a lot because most video cards have a single HDMI (which the rift needs), and people are already using it for their monitors. With the glasses thing.... I wear quite strong prescription reading glasses with a very different prescription for each eye. My glasses make zero difference to the image in my rift and I love that. So you may or may not need lenses, you will have to try it to find out. As for cleaning the lenses I wait until my rift is cold, huff on the lenses and use the cloth provided. I have cleaned my glasses this way for the last 40 years and yes I am pretty ocd about grease marks and dust on anything I have to look through. The focal distance of the Rift is about 2m. If you can see well at that distance you won't need glasses in the Rift. Anyone with more than a mild short-sightedness will want to wear glasses or contacts. If you're far-sighted you probably won't need glasses. Thank you all again. I did have one other question about the sensor set up. The Rift page about it is fairly informative, but I'm unsure about the orientation of the set up. The bottom of the pic is where my PC / Desk / Monitor, etc is all at, and is unusable as a play area. However, in front of all that I have a rough 2x2 open area to move around in which is the unfilled black rectangle. I was considering setting up a sensor above the sofa on the wall (gray oval), sit one on the bookshelf opposite at equal height (6'10 or roughly 2m in height) with a third one in the middle up on the wall, also at 2m in height, and angling them all towards the ground. The third sensor would be about 11 ft (3.35m) from the other sensors and I would be about 7.5ft (2.2m) from them all while in the very middle. Would this work? 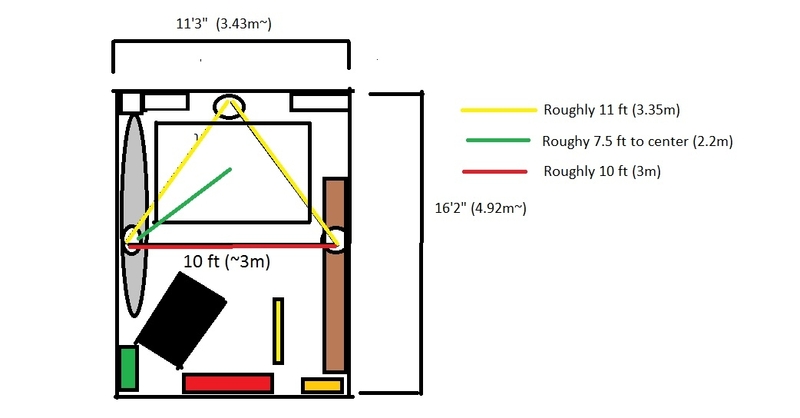 Kind of an equilateral triangle setup---or do I need to have more of a right triangle for better coverage i.e., move the lone sensor at the back to the wall over the sofa and space those two ~8ft apart and leave the one of the bookshelf where it is to act as the third sensor? Does it even matter? You'll have better coverage if you move that top sensor to one of the corners. You might lose a bit of coverage in the other corner, but if you put it in the middle you lose it in both corners. Even if it means the diagonal from that corner to the sensor on the bookshelf is a bit over 14 ft? I think it measures to roughly 14.5 ft from that corner to where the other camera would be sitting and the FAQ said nothing over 14 ft between two sensors. Yeah, that should be fine. I've got a similar distance on my diagonal, and it tracks very well. The setup program didn't say anything about my diagonal distance, but it did want me to push the rear sensor right to the side (I have it about one foot in due to furniture and sight lines).